Being Frugal and Making It Work: Spring Into Deals - Discover EggStravaganza! 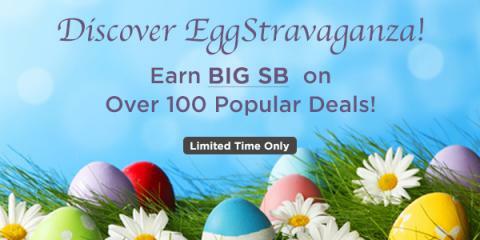 Spring Into Deals - Discover EggStravaganza! To celebrate the beginning of Spring, Swagbucks is offering HUGE SB on Discover offers, so now’s the time to try out some of these products and services! If you're not familiar, Swagbucks is a site where you earn points (called SB) for checking out deals and products from different companies. Then you redeem those SB for gift cards to places like Amazon, PayPal, Starbucks, Walmart, Target, and many more. You can also earn SB for things like shopping online, taking surveys, watching videos, and searching the web! To take advantage of the Spring Into Deals bonanza and check out over 100 Deals that are now more rewarding than ever, just click here to get started for FREE! Uber: Need extra cash? Earn with Uber & Get $90 in Gift Cards! Sign Up and Earn 3,250 SB. Take your first passenger and earn 5,750 SB? Winc: Discover your unique wine personality! Sign Up & earn –2,500 SB on your first order. + Earn an additional 2,000 SB when you stay subscribed for 2 months. eStories: Find your next favorite Audiobook and earn 2,000 SB!? Foodstirs:Introducing Foodstirs' simply delicious Darling Daisy Cookie backing kit. Purchase a 3 month subscription NOW with code SB50 and earn 4,000 SB? Check out all these great offers plus many many more! But hurry, this limited time offer is only good through April 16th. As a special bonus, if you sign up through my links this month and earn 300 SB before May 1st, you'll get a bonus $3 (300 SB) added to your account at the beginning of next month!